Sandra Kynes is a magical woman of many interests as her book catalog reflects. She’s the author of “Your Altar”, “Sea Magic”, “Whispers from the Woods”, and “Change at Hand” to name a few. 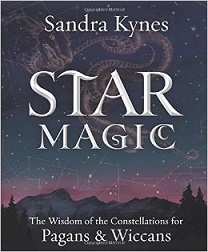 Now Kynes has written into new territory again with “Star Magic: The Wisdom of the Constellations for Pagans & Wiccans”. She starts with some historical background about astronomy and astrology, getting started with stargazing, and using star energy for magic and ritual. Using star energy for magic was inspired. Somehow for all the books I’ve read on using nature energies, until “Star Magic” I had never encountered a book suggesting using star energies. The moon? All the time. The stars? Not until now. She discusses using the stars for astral travel, dream work, and ritual. From there it becomes an incredible reference guide. To make it helpful to Pagans the chapters are divided seasonally. It focuses on the northern hemisphere, but she makes sure to flip it around for the southern for some of the southern hemisphere constellations that we catch up north as well. What do you get once looking at a single entry? A whole lot. Obviously there is the name of the constellation, along with a pronunciation. To help you locate it she provides visible latitudes (In Appendix A Kynes explains latitude and how you can find yours. ), a description of the constellation, what constellations border it, and some good ol’ directions on how to find it in the sky. From there Kynes fills you in on history and folklore involving the constellation and also a few of the prominent stars within the constellation. If that’s not enough for you, and it’s not because we were promised some magic, you’re given magical interpretations and uses for the constellation. In the appendices Kynes has an interesting section about the fixed stars of medieval magic. She discusses how we take for granted that now we know the difference between a planet and a star in the sky. More importantly, Kynes covers in detail Agrippa’s fifteen powerful stars which throughout time have been used medicinally, magically, and for astrology. Sandra Kynes has done it again! “Star Magic” is a wonderful reference that is accessible to anyone. It would certainly be a welcome addition on not only any Pagan or Wiccan’s bookshelf, but in any magic user or astrologer’s collection too. Did you know that Sandra Kynes wrote just as detailed of a resource about essential oils? Oh yes she did! 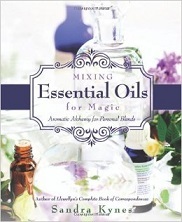 “Mixing Essential Oils for Magic: Aromatic Alchemy for Personal Blends”. Choose the best essential oils for your creative and magical mixing with this straightforward, hands-on guide. Through step-by-step instruction on how to measure, mix, and assess blends, you’ll move beyond following others’ recipes and into creating your own oil combinations. “Mixing Essential Oils for Magic” offers everything you need to understand not only how to blend but also why specific blends work together. Learn how to mix oils by botanical family, scent group, and perfume note. Discover an encyclopedic listing of essential and carrier oil profiles, as well as thorough cross-references for the oils and their magical associations. With guidance on the historical and present-day uses of essential oils, you’ll make personal blending an integral part of your spiritual and magical practices. Guess who has a copy to give away? Yup. May I direct your attention to the Rafflecopter entry form below?